The other day I went to see a friend I rarely see (due to distance). An hour into the conversation we finally got around to addressing what was staring us in the face, my unbelief. I was bluntly asked where my relationship with god was. I answered, just as bluntly, it does not exist. I said it was zilch, kaput, gone, and that there was no god. This was met with almost comical open mouth horror, as this was a friend who had relied on me for spiritual advice for years. One I had spent hours with discussing god and the bible. And now I was saying there was no god. Let us by pass the next few moments of utter disbelief, and my friend realising that I had said this almost unimaginable (for her) statement, and move on to the real point of this. My friend cares for a severely disturbed girl (about 8 or 9 years old). This girl is almost unmanageable and cannot be left alone as she will self harm. 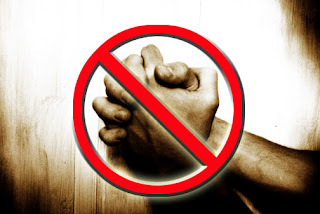 The conversation turned to prayer, and I was challenged on my stance that god does not answer prayer. I looked at the young girl and thought, why not? So I throw down the gauntlet, and said that if she really believed that god answered pray, then she would pray that god would heal her young charge. My challenge to her was, that if you believe in prayer, in miracles, that god is a god of love, that the bible is gods word and he keeps it, then pray for her healing. Right here, right now. The moment was almost breathless, while I waited in anticipation for her reply. Would she rise to the challenge, or not? My friend looked at the young girl, then looked at me, and said ‘but god may not choose to heal her, he may have other plans for her life’. And then she talked about how god has used this girl to show my friend things in her life. Excuse me, I thought. Was my friend saying that god will not heal a person who lives with disabilities, pain and suffering , who burns, cuts and mutilates herself and just so another person can lean say, patience, or learn some other useful ‘lesson’ in life. I was disturbed, not just by what was said, but that once I would have thought the same. The ability that we have to justify actions or non actions of others, including’ god’ is simply terrifying. By the way, she promised to pray for me as I left. I replied to her, "Don't bother."